If you have ever lived in or around New Mexico, you may understand my obsession with green chile. It’s like our official state’s food. We all eat green chile, and we like to put it on everything. I have actually had the great privilege of visiting Hatch, NM (where they grow the world’s best green chile) and walked barefoot in the fields, while picking fresh green chile, right off the plants. I love green chile. And I did say we New Mexicans like to put green chile on everything, right? So the other day, I was thinking, man… green chile gravy sounds pretty good. I actually got the idea from a local resident who makes breakfast burritos and drives around our town and sells them. She makes a meat and gravy burrito that is surprisingly delicious. 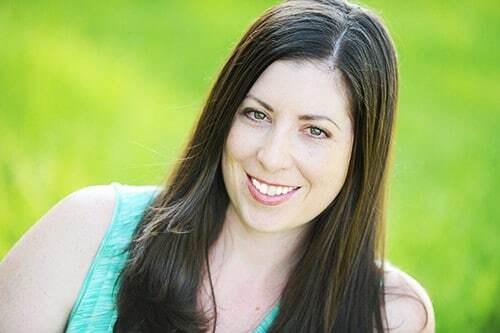 She uses homemade tortillas, and fills them with cooked ground beef and a green chile gravy. I think her gravy is more of a brown gravy (think beef broth and cornstarch), but I didn’t see any reason why a white gravy wouldn’t be absolutely delicious with a little chopped green chile. And I was right! 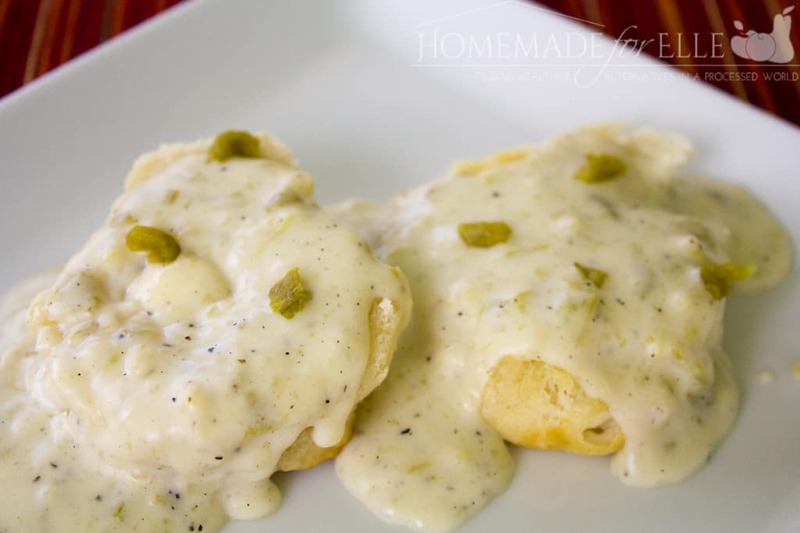 This classic white gravy is made from butter, flour and milk, giving it a great country taste, but the addition of chopped green chile gives it a nice spicy note that elevates the dish. Melt butter in a medium-sized pan over medium heat. Sprinkle in flour, and whisk well until the flour absorbs all of the butter. Slowly pour in milk, 1/2 cup at a time, whisking vigerously after each addition to break up the lumps and smooth out the gravy. The gravy will thicken as it cooks. For a thicker gravy, add in more flour, or to thin the gravy out, add in more milk. Once you’re happy with the consistency of the gravy, add in chilies, salt and pepper, and give it a good stir. 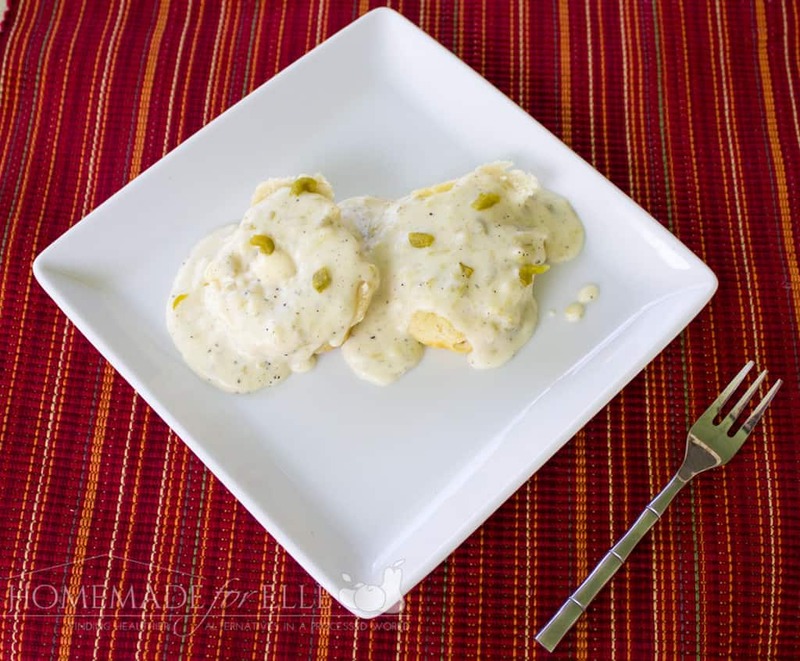 This green chile gravy would be great on chicken-fried steak, mashed potatoes or homemade biscuits. 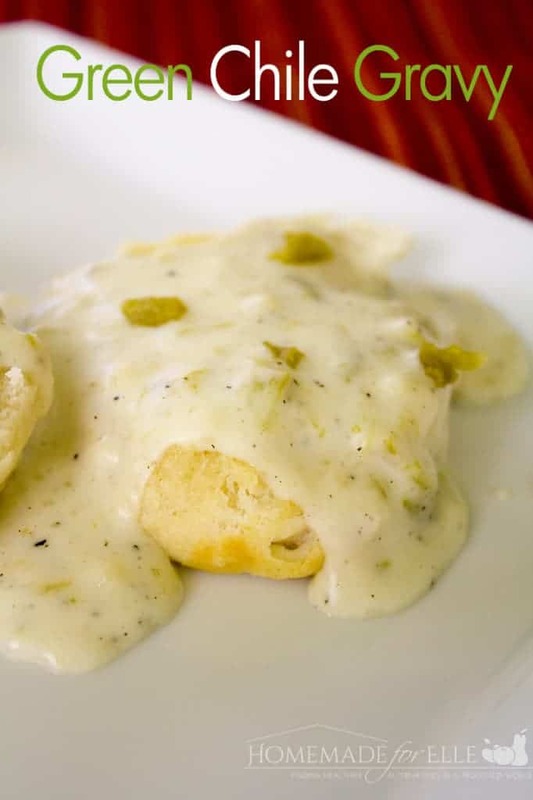 I have added chopped green chilis to my biscuit recipe for years, wanted to try a gravy with them. This recipe is perfect. I like this, and used half the amount of milk called for to make a nice rich gravy. I put this on top of my vegetable frittata that I made for breakfast.